For J. Frank Dobie High School, the bi-district UIL One Act Play production of “Wilderness” is about so much more than just punching a ticket to the next round of competition. The play, written by Seth Bockley and Anne Hamburger, is the story of six adolescents in a group therapy program who deal with a variety of mental health issues stemming from drug addiction, mental and physical abuse, bullying, broken homes, self-harm, sexual assault, sexuality and other factors. “A lot of the issues brought up in ‘Wilderness,’ like mental health, transgender issues and divorce, are often viewed as being taboo and so they really don’t get talked about much in the community,” said Dobie junior Stephanie Horton, who plays the role of Elizabeth – a child of a broken home and victim of domestic violence. “I think instead of ignoring these things and just hiding behind a smile to keep up appearances, it’s good to bring these topics to light so that we don’t push people who really struggle with these issues away,” said Horton. Dobie senior Elyssa Armenta who plays Chloe – a bullied girl who self harms as a result of abuse, said that she hopes the play will advance conversations about teenage mental health. Dobie High School senior Elyssa Armenta runs through her lines as she prepares to play Chloe in the school's One Act Play. 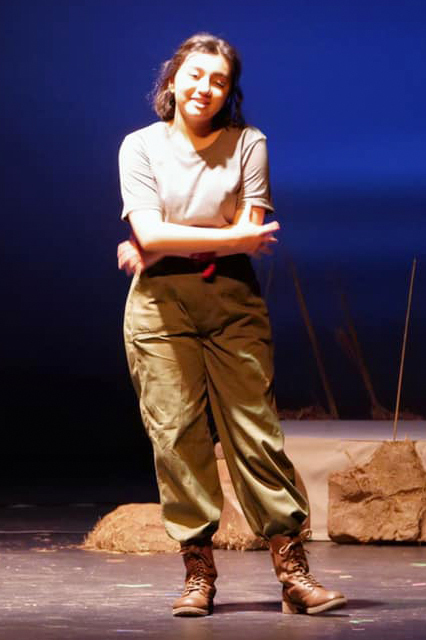 For Dobie Theater teacher Juliet Weigand, the story of “Wilderness” is a powerful one that has dramatically touched the lives of all her students. Due to the heavy nature of some of the subjects, cast members participated in special exercises where they learned how to detach themselves from the lives of the character they play. “Dealing with some of the difficult topics has been hard, not only for me but for many of the actors because a lot of us have first-hand experience with many of the issues that ‘Wilderness’ deals with, even if it is not to the same extent,” said Horton. For one class period, Weigand even halted practice to bring in Dobie counselors Erin Richardson and Kelcey Davis to speak with the cast about the topics and share positive coping mechanisms. Armenta said that being a part of “Wilderness” has given the cast members a place where they can openly talk about their own struggles. The play, set in a wilderness camp in the mountains of Utah and based on real-life stories, has also opened up cast members' eyes to the struggles of others. “Realizing that these are real things that happen to real people every day was something that was really important to go through,” said Kayla Newsome, who plays the role of Sophia – an adolescent that struggles with anxiety, panic attacks and violent tendencies. Riley Gilbert, a senior who plays Elizabeth’s strict military father, added that the play has given him a deeper understanding of others. At the district competition, Armenta said that she had several female audience members that came up to her to thank her for portraying the struggles of her character in a way they strongly related to. “Wilderness” will be performed by Dobie Theater as part of the UIL One Act Play bi-district competition at approximately 6 p.m., Tuesday, April 2, 2019 at San Jacinto College - Central Campus. Tickets are $10 and can be purchased at the door. Dobie High School cast members prepare for the upcoming bi-district One Act Play competition by running through scenes from "Wilderness."